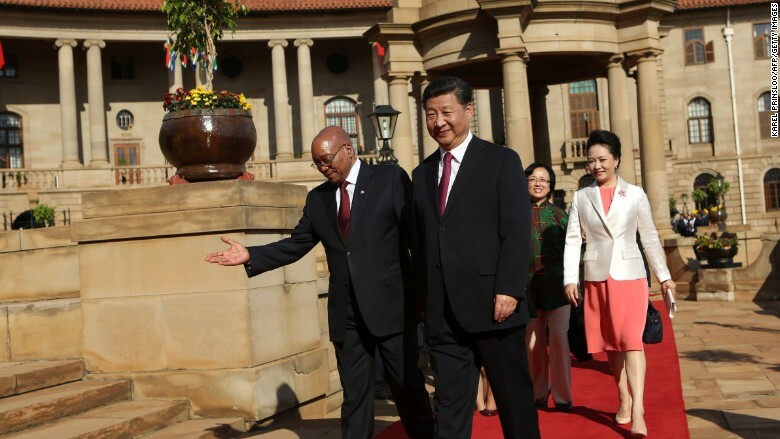 Chinese President XI Jinping met with South African President Jacob Zuma this week. China is still spending billions in Africa despite its economic slowdown, inking trade deals, investing in mining and infrastructure, and offering development aid. Just this week, during a visit to the continent, China's President Xi Jinping agreed to invest $6.5 billion in South Africa. China's rapid ascent to the world's second-largest economy has meant high demand for energy and raw materials. It has long courted Africa to gain access to the region's rich natural resources -- over the years, China has invested and helped to develop Africa's energy industries. Xi, in particular, has made it a priority -- Africa was his first overseas stop after taking office in 2013. And by the end of that year, China's direct investment in African countries totaled about $26 billion, according to the Brookings Institution. Under Xi, China has also made more financing available to Africa. China has issued at least $10 billion in loans to African countries as part of a larger funding package, prioritizing infrastructure, agricultural and manufacturing, according to the Council of Foreign Relations. And there's much more to come. China has pledged to provide $1 trillion in financing to African countries by 2025, Brookings cited an official at the Export-Import Bank of China as saying. Trade relations also continue to grow. In 2009, China surpassed the U.S. as Africa's top trade partner. China's trade with Africa hit nearly $200 billion in 2012, according to Brookings.